I must have driven through Beaufort West a dozen times, perhaps two dozen, before coming across these photographs, but I had never seen it. That there was a prison in the middle of the traffic circle at the edge of the town centre, that there was a traffic circle at all: I did not recall these things. I was hardly alone in this. 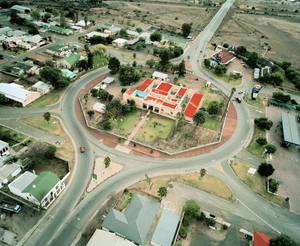 South Africa’s longest highway, the 1,200-mile road that joins the northern provinces of the country to the south, slices right through Beaufort West, becoming its main street for a short time. Mine was one of several million cars that pass through each year. Coming from Johannesburg, as I invariably was, two hundred miles of the Great Karoo lay behind me. By the time I got to Beaufort West I carried in my head mile upon mile of scrub-swept desert: a still, empty landscape beneath a vast sky. I was always at the beginning of a holiday, on the way to the coast or the mountains; and the Karoo was something of a foretaste of what lay in store, an early promise of slowing rhythms, of the idea that an entire day might pass without anything in particular to do. Always, somewhere in the Karoo, I would pull off the highway, drive along a dirt road far enough to kill the sound of the traffic, and get out of the car. I’d take in this huge, still space, its receding power lines, its sudden, sharp-edged hills, its benign indifference to me. Beaufort West was a scruffy, ugly interruption, a brief absence of landscape, rather than the presence of something else. Traffic circle, prison: these I did not see. My mind had slammed itself shut on the edge of town. 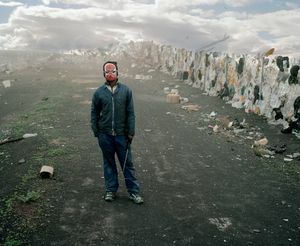 And yet, when I first saw Mikhael Subotzky’s photographs, they were instantly recognisable. My first thought was ‘Of course’. The prisoners in their orange overalls, the hunter’s corpses strung up on his truck, even the anarchically coloured debris on the rubbish heap and the huddle of figures who live there: it all seemed utterly familiar. 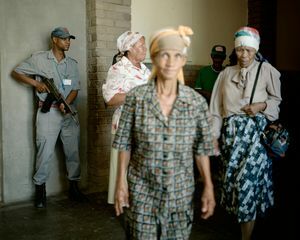 For these photographs give expression to something one understands – even while choosing to forget – whenever one passes through a distant rural town: that the South African countryside has lost the discrete identity it once possessed; that it is becoming a repository for the people and things the cities cannot contain. Rural South Africa has emptied over the last couple of generations. The number of commercial farmers has declined by almost a third. More and more of those who remain have mechanised their work and employ fewer and fewer people. As for the rural poor, everyone goes to the city. Whether with their family’s consent or on the sly, whether alone or with others, scores of young people leave sometime in their teens. It is unusual these days for a person to reach adulthood with visions of spending the rest of their life in the countryside. And so towns like Beaufort West are increasingly inhabited only by the young, the old, and those who haven’t made it elsewhere. The lives of these last follow an endless loop as they move from rural town to city, city to rural town. Drifting from one to the other, they find traction in neither. To spend the better part of one’s adult life in rural South Africa is, for many, to have lost control over one’s trajectory. These photographs thus represent a place in which far too many people do not possess the basic structure of what we regard as an inhabitable life: a sense of life as a project, or at any rate as some sort of progression; the notion that one might leave a legacy, or build something that survives one’s death. Not long ago, the South African countryside did play host to many such inhabitable lives. Its emptying of people and meaning has coincided, more or less, with the end of apartheid. This is no accident. The economy of the countryside was hardly built to last. It was always an illusion that black South Africa could be confined to a perpetually rural existence, an illusion invented by people who did not bother to think more than a generation ahead. That apartheid has bequeathed to democracy a rural landscape in deep, probably irreversible, decline is no surprise. You can see the trouble Beaufort West lives with in the thin abstraction of statistics. Two-thirds of its adult residents have no work. And in this town of 37,000,more than 20 people have been murdered in a year: a hair-raising homicide rate of 60 in every 100,000. That’s nearly 10 times the New York rate, 20 times that of London, and one and a half times that of Johannesburg, among the most dangerous places on earth. Which brings us back to the prison on the traffic circle. Thousands of travelers like me may not have seen it, but this was the spectacle that initially caught Subotzky’s eye, giving him cause to stop in Beaufort West and take out his camera. Once you think about it, the very idea of this prison, slap-bang in the middle of South Africa’s most traveled national highway, is so bracing you’re not sure whether to find it funny, tragic, or simply insane. It seems less a piece of reality than the work of a comic artist straining to capture this town’s relation to the world that passes through it. For here is somewhere increasingly forgotten by post apartheid South Africa. And yet those who inhabit the country’s metropolis pass through in their millions; and those who are failing most miserably here, who wind up again and again in the town’s jail, get to rotate between a life in the township and a life in the middle of the highway, quite literally listening to the traffic of an economy in which they can find no place. It is as if a never-ending jamboree is passing through Beaufort West, and those most embittered by the spectacle have been sentenced to sit in front-row seats. If the image of the prison in the road is indeed so sharply burlesque, and the story it tells so instantly complete, why did I never notice it? I guess because I was always on the way to the mountains or the sea, and because the Karoo is so deeply beautiful. We urban South Africans are very proud of our countryside. We rejoice that our cities skirt the edge of a great wilderness, that there are mountains and oceans and deserts just out of sight. I do not know anyone in Johannesburg or Cape Town who isn’t a part-time fisherman, or a mountain climber, or the owner of a kayak or a canoe, or who does not spend a part of each year in a house looking out over the ocean. The countryside and the sea live in each one of us. That we have just been there, or will soon go, to empty our minds, is a part of who we are. The hinterland is thus sacred space, after a secular fashion: out there one communes with whatever passes in one’s mind for the spirit world. It is not an easy space in which to imagine the lives of the poor and the struggling. You can know that they inhabit it, but imagining them there is a different matter. It is easier to think of South Africa’s wretchedness as something that has been deposited in the cities. And so after several hours of the Karoo, this great desert all around you, you do not have a place in your mind for Beaufort West. Which is partly why Subotzky’s photographs give you the sense that you are looking at something you have always known and yet have never seen. It is not just that the Karoo landscape in his pictures is inhabited. It is that the landscape is so patently a backdrop to the imaginings of the people in the photographs. They are using it: to transport themselves, to elevate themselves, to re-describe themselves. In picturing them Subotzky does more than simply stitch the desert and the people back together. He takes us on a sometimes disquieting adventure, asking us to imagine how the desert is imagined by those who live there. Almost every photograph carries a suggestion of theatre, and almost every theatre uses the desert as its stage. The boy on the rubbish heap who has donned the Spider-Man mask he found in the trash; the children launching the white sheet into the wind; the screaming man and the princess on their manicured horses; the white girl with the competition tag and high heels on the black-floored stage, posing for an audience off-camera; the snake and the elephant staring so very sweetly at the ill man on the bed; the prisoner lying beneath a massive mural of cacti and sand and stone, like a giant bubble representing the inside of his mind. In each photograph the subjects transport themselves elsewhere: where, precisely, we are not sure. For one photograph it seems possible to imagine quite vividly what its subjects are imagining: the panorama group portrait of the prisoners in their orange inmate overalls. This is also the photograph I find most affecting. It is not just the obvious delight they take in the portrait, evidenced in the warmth and playfulness of their inscriptions. Beyond that, the picture is striking because there is little to suggest that it was taken in Beaufort West. 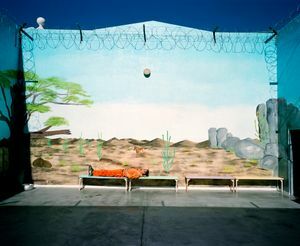 The cartoonish iconography of the sunrise, the number ‘28’, the way the two men next to Dogg and Tamatie wear their woolen hats: this photograph could have been taken in a big Cape Town prison, the inmates all men from the ghettos on the city’s south-eastern periphery, the desert mural behind them representing the longings of urban men for open space. They could easily be Capetonians imagining themselves in Beaufort West. It would be foolish, of course, to get carried away by this idea. Amidst the levity in the photograph there is a whiff of something forlorn and unhappy: this small prison in the middle of a traffic circle in a one-horse transit town, its inmates modeling themselves so studiously on the fearsome rulers of Cape Town’s bleakest ghettos. And yet, since the icons they have chosen are so stark, their meanings so widely shared, it can be conjectured with some certainty that in their minds if not on their lips is a man called Nongoloza, the part-historical, part-mythical figure on whom all of South Africa’s great urban prison gangs base the story of their own beginnings. In the tale the gangs tell of him, Nongoloza is a young black man who finds himself at the fount of modern South African history. Gold has just been discovered, and the whites who own the mines are sending blacks deep into the ground to fetch it. Nongoloza refuses to do that. He recruits a band of followers, retreats to a cave on the outskirts of the mining town, and comes out at night to steal and pillage the very gold the whites have accumulated. And so Nongoloza becomes an outlaw, the most wanted and most dangerous man in the land. As his fame grows, so young black men start seeking him in droves, and the ranks of his bandit army swell and swell. From the names they have chosen and the icons they have drawn, it is clear that this story plays in the minds of everyman in the photograph. Sitting for a group portrait in a prison in unremembered Beaufort West, they have imagined themselves into a central seam of South African history. They are free and dangerous, with vengeance on their minds and justice in their hearts.